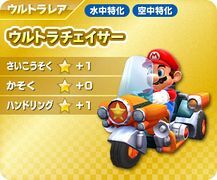 The Ultra Chaser is a kart found in Mario Kart Arcade GP DX. It takes the appearance of an orange motorcycle, with a headlight bearing a star on it. Its alternate colors are blue and white. Its appearance is made to resemble a traditional American police motorcycle.